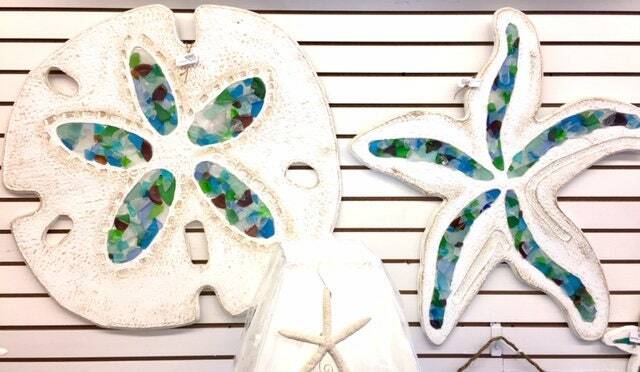 This large sand dollar and starfish (32"), has been handmade by Mike, one of our Beach House Dreams artists. It can be hung indoors to refresh your living spaces or outdoors to enhance your pool, hot tub, dock or back deck. You are choosing one (1) large 32" Sand dollar OR starfish. Each one will be slightly different as these are hand cut, hand painted with Behr outdoor paint, with local Outer Banks seaglass added,but each will be 32" wide and 32" tall as shown in photos. Zoom in to see the exquisite details, as Mike carefully carves the surfaces of these pieces to give them extra texture and dimension. These will ship within one week of purchase, and will be carefully packaged and shipped via usps Priority mail, or UPS if you are on the west coast. BEAUTIFUL piece of craftsmanship! FAST Shipping! Excellent Customer Service! I'll be back again! Thank You So Much!!! All The Way A+A+A+A+A+A+A+A+A+A+A+A+! These were the perfect present to give my parents for their beach house! Very cute, beachy, but substantial hooks. I am very pleased with them. Shipping as promised. Love seeing the sea creatures on the wall. Great customer service as well!